There is seemingly no end to the lengths that former and current meat-eaters will go to find meat substitutes that taste exactly like — meat. Food companies developing plant-based meat equivalents seem aware of that juicy tidbit. And now, Google may be getting into the act, apparently pursuing a long-term interest it has had in the food industry — starting with founder Sergey Brin’s cultured beef project, a stab at making burgers from stem cells. Now, an unconfirmed report has it that Google recently tried to purchase Impossible Foods, the outfit behind another vegan burger under development called The Impossible Cheeseburger. While vegetarians would generally refer to such a food as “a garden burger,” Impossible seeks to go much further than simple run-of-the-mill meat emulation. The Impossible Cheeseburger is designed to look, smell, taste and cook like it came off the hoof. We looked at animal products at the molecular level, then selected specific proteins and nutrients from greens, seeds, and grains to recreate the wonderfully complex experience of meats and dairy products. For thousands of years we’ve relied on animals as our technology to transform plants into meat, milk, and eggs. 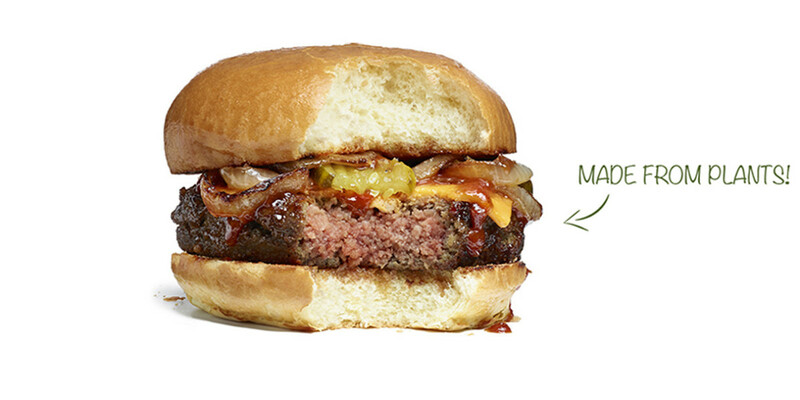 Impossible Foods has found a better way. Where does Google fit into this scenario? Sources told The Information [paywalled] that Google had offered to pay some $200 to $300 million for Impossible, but was turned down. That’s all unconfirmed at this point because neither company is mooing. But Impossible is not the only one out there with its eye on a new kind of non-meat. It turns out that the company — which counts Bill Gates and Google executive Tony Fadell among its angel investors — is one of several startups trying to develop sustainable, healthier and more cruelty-free food. What might interest Google in this company? Perhaps it’s a result of Impossible’s scientific underpinnings, as personified by its founder, former Stanford University professor, physician and biochemist Patrick Brown. Brown also co-founded Lyrical Foods’ Kite Hill brand, which sells plant-based dairy substitutes. Whatever the interest, after raising around $75 million, Impossible is reportedly returning to the fundraising trough. Impossible Foods’ cheeseburger is intended to be sold in grocery stores by next year, and it also wants to make other meat substitutes.